Fifthly: Your call, in your book, "Mashroo'iyyat al-Jihaad" (pp. 28, 37, 39) and your book "al-Wasaayaa al-Ashar" (p. 71, p. 44) to the splitting of the Muslims into groups and parties, and your saying, "This is a manifestation of health (robustness)." 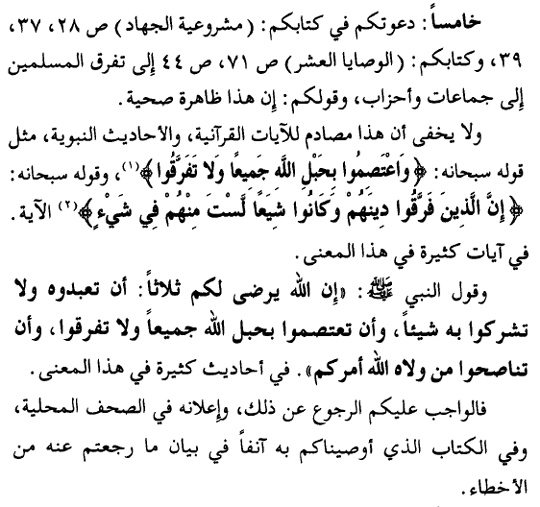 And it is not hidden that this clashes with the Qur'anic verses and Prophetic ahaadeeth, such as His, the Sublime's saying, "And hold fast to the rope of Allaah all of you and do not be divided" (3:103), and His saying, the Sublime, "Verily, those who split their religion and became sects, you have nothing to do with them at all" (6:159), to the end of the verse. [This is stated] in many verses with this meaning. And the saying of the Prophet (sallallaahu alayhi wasallam), "Indeed Allaah is pleased with three things for you: That you worship Him and do not associate anything with Him (in worship), that you hold fast to the rope of Allaah, all of you and not be divided, and that you give sincere advice to whomever Allaah has placed over your affairs." [This is stated] in many verses with this meaning. Thus, it is obligatory upon you to recant from that, and to announce it openly in the local newspapers and in the book that we have advised you with just now, in explanation of what you have recanted from of errors. Abd al-Rahman Abd al-Khaaliq legislated splitting and partisanship into the deen of Allaah, by legalizing the presence of parties, groups and sects, claiming it is a good thing and a sign of health and robustness of the Ummah. He is following in the footsteps of Hasan al-Banna, and this "ta'addud al-jamaa'aat" (multiplicity of groups) that Abd al-Rahman Abd al-Khaliq was speaking of in his books is a rendition of the golden principle of Hasan al-Banna, "Let us cooperate in that which we agree, and let us excuse each other in that which we disagree." The aim behind these approaches is to gather together as many people (of different backgrounds, creeds, affiliations and orientations) as possible so that they can be led and mobilized in whatever methodology is suitable for a particular country in order to help take power from the current governments and rulers who are considered apostates and disbelievers because they do not judge by what Allaah has revealed. Hence, in one country in might be entry into democracy, in other it might be a coup, in another it might be demonstrations and rallies, in another it might be a violent revolution. So this is the Ikhwani manhaj that Abd al-Rahman Abd al-Khaliq was pushing to a Salafi audience and the vehicle for that was Ihyaa al-Turaath al-Kuwait which still operates on this basis, using charity organizations as fronts for pushing their orientation into communities in different parts of world through the lure of financing in the name of "da'wah" and "spreading goodness."